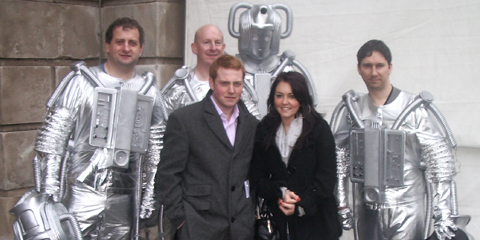 Hyde Fundraisers formed back in 1985 initially by a group of friends who had met at the Blackpool Dr Who Exhibition. Nigel Peever and Andrew Crombie were amongst our early trailblazers in costume and prop making. Those talented individuals helped to grow our talented team which continues to develop even further in 2019. Many of those original friends from Blackpool are still involved over 34 years later - friends with a common goal to support good causes! Cheryl Mellor, of Dizzi Gothic, continues to be our mainstay in creating the soft costumes for our characters. Amongst her creations has been the Clockwork Droids, Auton Bride, Silurian Leader, Judoon along with Planet Of The Apes. Her future projects will include completing a Warriors Of The Deep Sea Devil and Gallifrey's Chancellry Guards. For over 17 years Phillip Robinson from Durham has been a creative hub of classic characters from Dr Who and Star Wars. Producing realistic likenesses of Ray Park, Tom Baker, Peter Cushing and more. 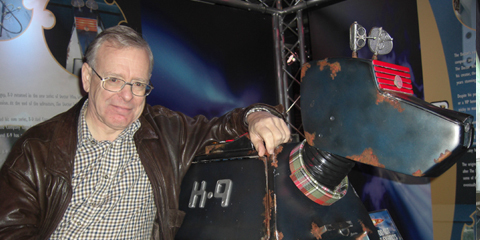 He created the masks for a number of creatures for The Trial Of Davros which included the Davros mask worn by Terry Molloy. His latest collaborations with his Shape Shifters team has brought us the return of some favourite 1970's monsters. The Zygon's were a fantastic achivement surpassed by the debut of The Ice Warriors at the 2019 Science Of The Timelords event. Phillip continues to be a staunch supporter of Hyde Fundraisers showcasing some of his latest characters at our fundraising events. Ray Phillips has amassed an incredible technical knowledge in creating some of his props and masks over the years culminating in the use of the latest 3D print technology. His creations have included The Smilers, Pig Slaves, Scarecrows, Ood and Star Wars characters. 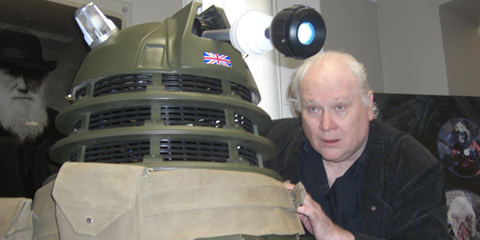 Amongst his larger props are R2D2 and one of the new series Daleks. 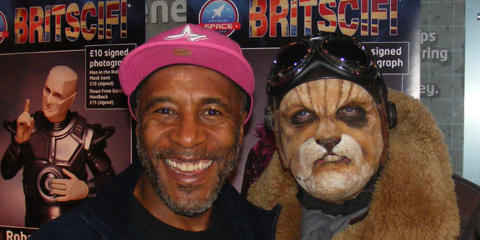 In recent years he has frequently appeared with the group to showcase some of the techniques utilised in making masks and props. 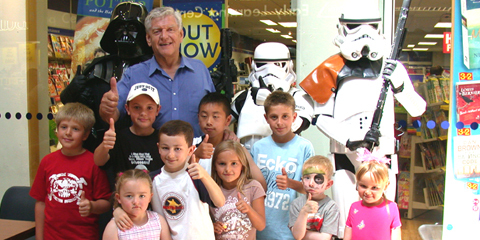 An established name in fandom Derek Handley has provided invaluable reference and help to Hyde Fundraisers over the years. In 2017 we were delighted to welcome some of his Voc Robots to the monster menagerie. In 1993 Hyde Fundraisers organised their first convention - REMEMBRANCE 93 at The Village Hotel in Hyde. That event included the first staging of The Trial Of Davros starring Michael Wisher as Davros. Two further Remembrance conventions were organised at the Periquito Hotel, Oldham in 1995 and 1997. In 2005 the group celebrated its 20th anniversary by restaging The Trial Of Davros at Tameside Hippodrome starring Terry Molloy. Playing to over 900 people for a 'one night only' performance the show raised £4000 for BBC Children In Need and £3500 for the NSPCC.